Over the past two decades - that's roughly three generations, in cheetah terms - the population of the world's fastest cat has declined by 30 percent. The main reason for this fall isn't clashes with other predators like hyenas and lions but pressure from humans. In resource-poor environments like the Kalahari desert, spending energy wisely is the key to survival. As fast as cheetahs are - top speeds of up to 59 mph - their lightning-quick hunts are over in a matter of seconds. The big cats expend much more effort looking for an antelope herd, for example, than hunting down a single animal, according to an international team of researchers who tracked the way these cats prowl through southern Africa. In practical terms, a major portion of a cheetah's energy likely goes toward circumventing human-made obstacles, the scientists say. Previously, ecologists had noted that scavengers like hyenas would swoop in and filch a cheetah's meal. 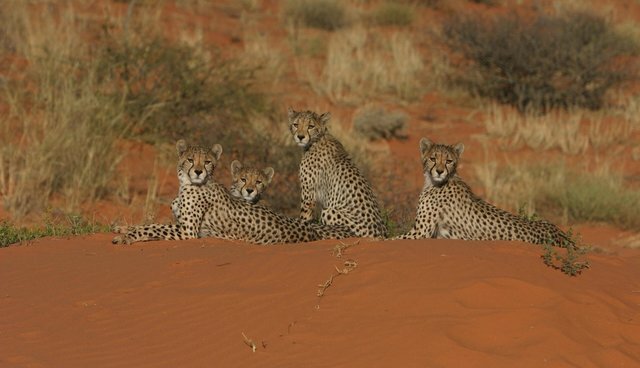 But for this to be a significant impact for hunting cats, thieves would have to run off with more than half of the cheetah's food - and the scientists observed much lower rates of food theft in their two-week long observation of 19 wild cheetahs. Instead of a huge energy sink, food theft increases a cheetah's energy output by roughly a tenth. By injecting heavy water into cheetahs, the researchers could monitor the cats' feces to see how much water cheetahs excreted each day, as an indicator of energy use. Cheetahs expelled more heavy water (a rarer, but not radioactive, form of water also used in experiments with human metabolism) as the big cats went looking for food, rather than in the quick bursts used to chase prey down. Given their reputation as speedy felines, ecologist Michael Scantlebury at the Queen's School of Biological Sciences in Belfast likens them to Ferraris - capable of incredible bursts of speed, "but most of the time they are driving slowly." During their slow drives, which consume most of the cheetahs' energy, the radio-collared cats walked around fences and trekked long distances in search of prey made scarcer by human competition, the scientists report in the journal Science. "If you can imagine walking up and down sand dunes in high temperatures day in, day out, with no water to drink you start to get a feel for how challenging these cats' daily lives are," states Scantlebury, "and yet they remain remarkably adapted and resilient."